All kids love memory games! Nothing is nicer when there is a theme especially a theme that is not really used very often. 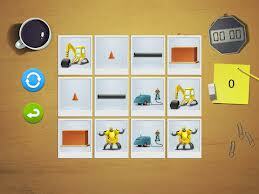 Build and Play-Construction Play Scene Free version and review of the $1.99 version, by We are Interfaces AB. Why does this make app appeal to the autistic community? It has the ability to change the number of matches from 4-6-16. The theme is the same all kinds of bulldozers, and interactivity that is not too overwhelming. Memory games such as this assist in planning skills and problem solving which encourage the child‘s cognitive skills. Many children with autism have sensory processing difficulty. Build and Play has an option to listen to music while playing the game to help increase the child’s sensory processing difficulty. You can start of slowly with 4 cards and increase as time goes on. Finally, if you are a teacher this is a great app to increase social skills by taking turns. I will add a taking turns app to help students ease into this concept. Bottom line this game is fun and increases the transportation vocabulary! It can start off slow and increase as the child is ready to. Definitely hands up if you are hesitant get the free version to try it out. If you have a “typical” child and a child with needs this is a fun way for them to interact. This alway an ongoing question parents asks how can I get my children to interact? Here is one game that all ages enjoy and play with their siblings. Duckie Deck , by Duckie Deck Development, FREE learn about sharing with your peers for pre school– older children with Autism. Learning how to share at a young age is extremely important for young children to comprehend not just through words but actions really clarify HOW to share with friends of all races. The app includes a matching game where each child cheers after their friend takes a turn. There is one game with objects and three children hoping for particular gifts. It shows their disgruntled faces when they do not get the gifts they want. It makes for a great discussion about being grateful when we get something. It is important to talk about feelings and what faces look like when a child is unhappy. 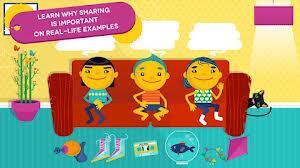 Each story continue to show or talk about sharing experiences. They each teach a different lesson to help children understand when one person gets all of one object and the others get none. As children grow they will remember this lesson because it does have impact on children’s lives. We realize we need to tech this skill early whether the child has a disability or not. This app also has some fun interactive interaction in addition to sharing keeping up the children’s curiosity. Duckie Deck is a fun interactive FREE app that goes a long way! Enjoy now while it’s FREE!